Bodrum is an ancient and beautiful port city situated on Turkey’s Bodrum Peninsula, on the south-west coast of the Aegean Sea. Populated by just under 40,000 people, it is a popular tourist destination and an art, entertainment and trade hub. 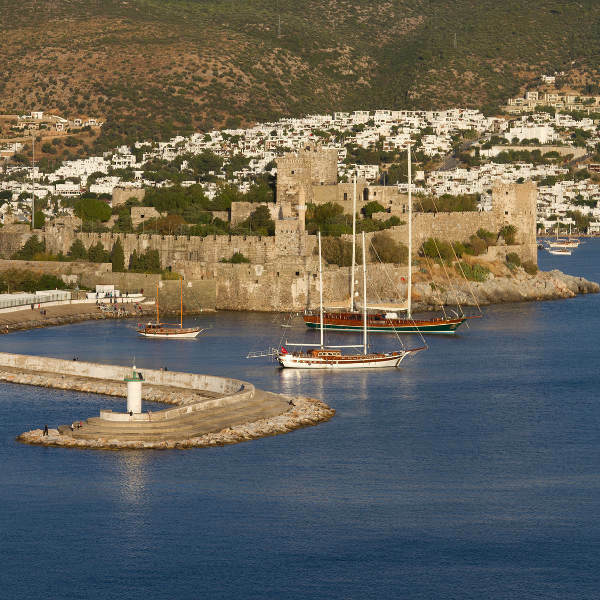 Bodrum is famed for the 15th century Bodrum Castle and the Mausoleum Halicarnassus archaeological site. Cheap flights to Bodrum are now available for a limited period of time, so prepare to marvel at the art, history and beautiful sunsets this city has to offer! Bodrum is served by the Milas-Bodrum Airport (BJV) which is a 30-minute drive from the city centre. BJV mainly serves national flag carrier, Turkish Airlines. Milas, a city just a few kilometres away from Bodrum, is an ancient gem filled with history and wonder. 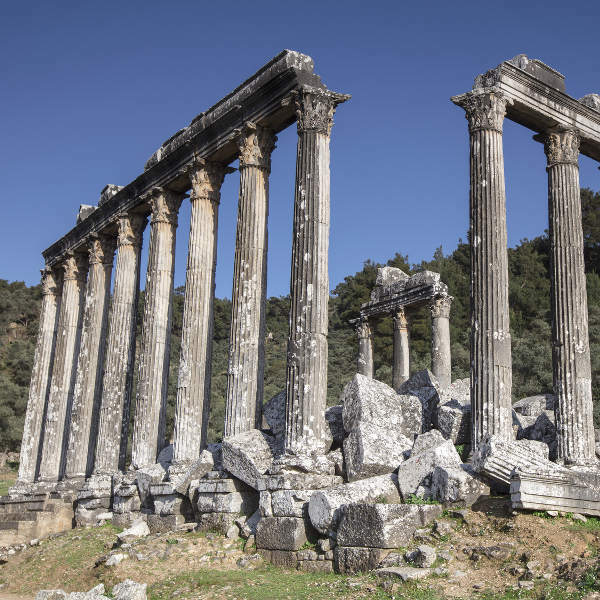 Take time to tour the 27-remarkable archaeological sites this city boasts, like the Temple of Zeus. The Bodrum Castle is a majestic, prominent landmark of the city’s skyline where you can relive history or discover artefacts from old shipwrecks at the Museum of Underwater Archaeology. Go boating, take a dip in the Aegean Ocean or watch the world pass by at one of the many restaurants or beach clubs along Bodrum’s glistening, blue waters. 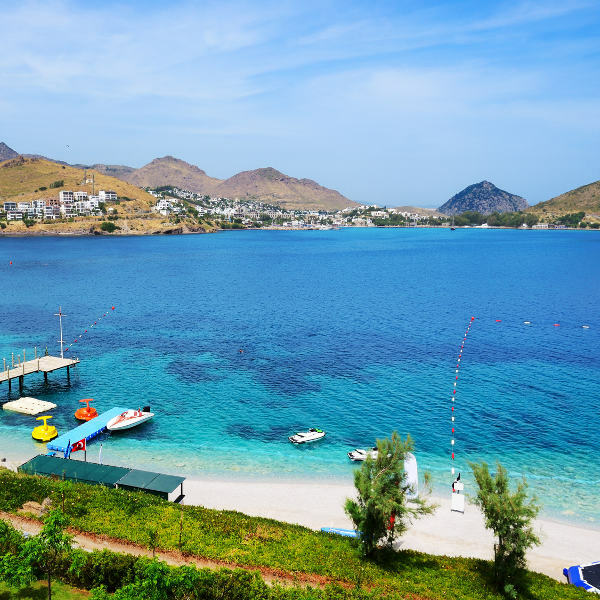 Bodrum is a beautiful port city that attracts visitors to its shores all-year-round, however the best time to visit is in the long summer period between July and mid-September. This is one of the peak tourist seasons in the city, the other being the Christmas and New Year holidays. The hot summer sun and blue waters attract quite the crowd during these months, so air fares, accommodation and general prices are at their highest. To enjoy this incredible destination without having to pay an arm and a leg for your holiday, travel to Bodrum during the shoulder season months of April, May, mid-September and October. The temperatures will still be pleasant and warm enough for beach days and sightseeing. Bodrum is a beautiful port city situated on Turkey’s Bodrum Peninsula, on the south-west coast of the Aegean Sea. This art, entertainment and trade hub is a unique blend of ancient city and vibrant urban lifestyle. The 15th century Bodrum Castle, also known as the Castle of St. Peter and the Mausoleum Halicarnassus archaeological site, which is one of the Seven Wonders of the Ancient World, are renowned must-see tourist attractions. The coastline, decorated with lush vegetation, white sand and welcoming lounge seats on beautiful decks, provides perfect views and an array of holiday activities. Take a dip in the cool water or sunbathe at Gumbet and Bitez beach. While there, you can enjoy a drink at one of the many pool bars or be adventurous and hire a boat for a scenic trip along the bay. After a long day of fun in the sun and sightseeing, try out the Turkish bath experience at the lavish Bodrum Hamami near the harbour. A soak and a relaxing massage later, take a trip to the Bodrum Marina where you can indulge in traditional Turkish food like fresh Lahmajoun and delicious seafood. The marina hosts boutiques and designer clothing stores where you can shop to your heart’s content. Compare several airlines, and book your cheap flights to Bodrum Milas online at Travelstart. Make sure your routine vaccines include the MMR vaccine, DPT, Chickenpox, Polio and yearly flu shots are updated before travel. As an additional precaution you should get vaccinations for Hepatitis A and B, Tetanus, Typhoid and Rabies, as you may be exposed to infected stray dogs and other mammals while on holiday. Bodrum is a fairly safe city, however, you should still practice normal safety precautions such as keeping your valuables and important documentation safe and, although it is uncommon, watch out for petty crimes like bag-snatching or pick-pocketing. Keep an eye out for restaurants that may overprice your bill exorbitantly - this has been a problem of tourist-scamming in the past. There is also a vast amount of stray dogs that inhabit the city, they can be harmless but be cautious around them, especially with children.